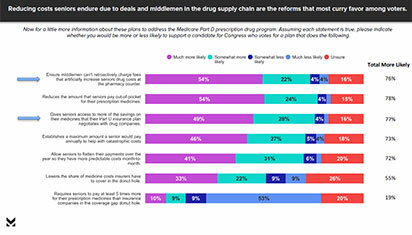 Reducing drug costs borne by seniors due to middlemen and deals in the drug supply chain are Medicare Part D reforms that most strongly curry favor among registered voters, according to a Morning Consult survey commissioned by the National Community Pharmacists Association. 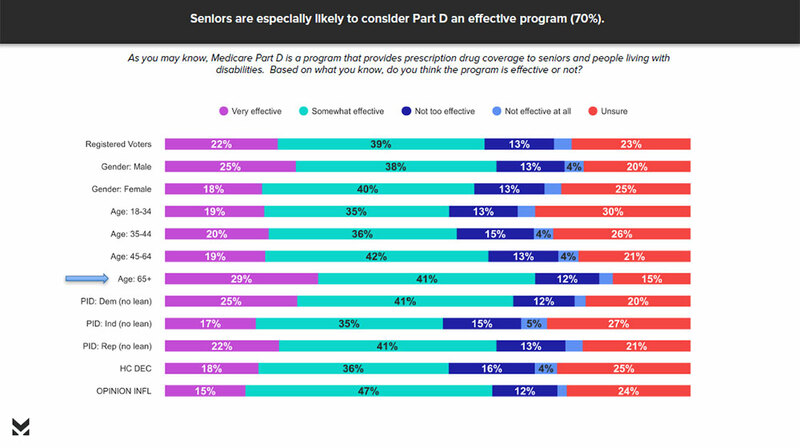 Conducted in late June, the survey results indicate strong support among voters for measures that would increase stability in the popular Part D program while also lowering costs for seniors. 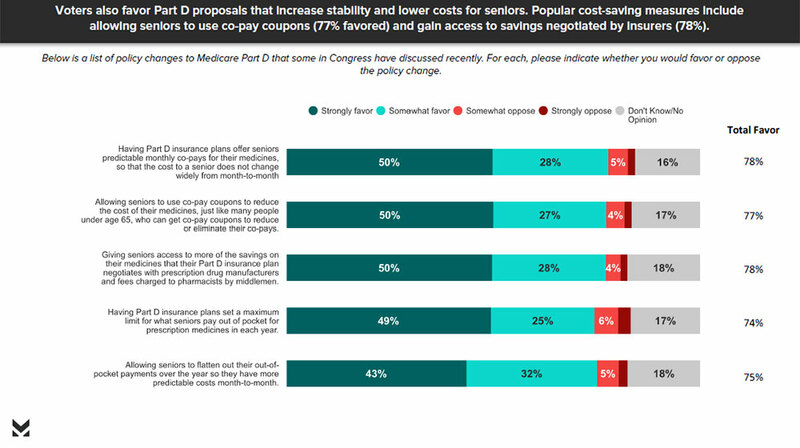 Popular cost-saving measures include requiring insurers and pharmacy benefit managers to directly pass discounts they negotiate with drug companies to seniors, allowing seniors to access lower co-payments by assuring they can obtain prescriptions from the pharmacy of their choice, and prohibiting PBMs from charging retroactive fees to pharmacies – fees that artificially raise seniors' out-of-pocket costs. 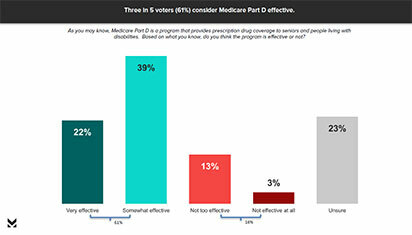 "Healthcare issues ranked high among concerns in this nationwide survey of nearly 2,000 registered voters – and particularly concerns related to the Medicare Part D prescription drug benefit," said NCPA Chief Executive Officer B. Douglas Hoey, Pharmacist, MBA. 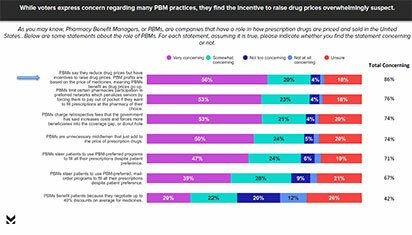 "Respondents voiced strong concern about the perverse incentive pharmacy benefit managers have to raise drug prices, including retroactive fees PBMs charge pharmacies that have the effect of pushing Medicare beneficiaries more quickly into the coverage gap – the so-called 'donut hole' – and eventually into the catastrophic phase." 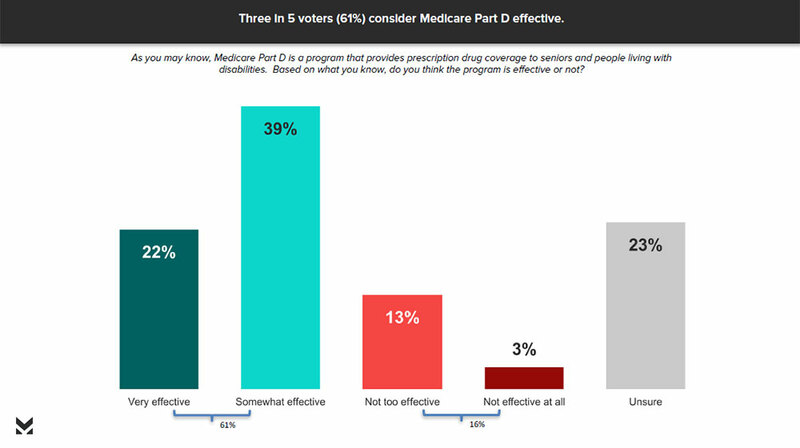 "Only registered voters were surveyed, and the responses clearly demonstrate that voters are more inclined to support candidates who back common-sense Medicare Part D reforms that lower patient costs and expand patient access to their prescription medications," Hoey added. "The survey also validates policy recommendations NCPA has made to the Trump administration and the Centers for Medicare and Medicaid Services in response to the administration's request for information regarding the drug pricing blueprint it announced in a Rose Garden ceremony back in May." 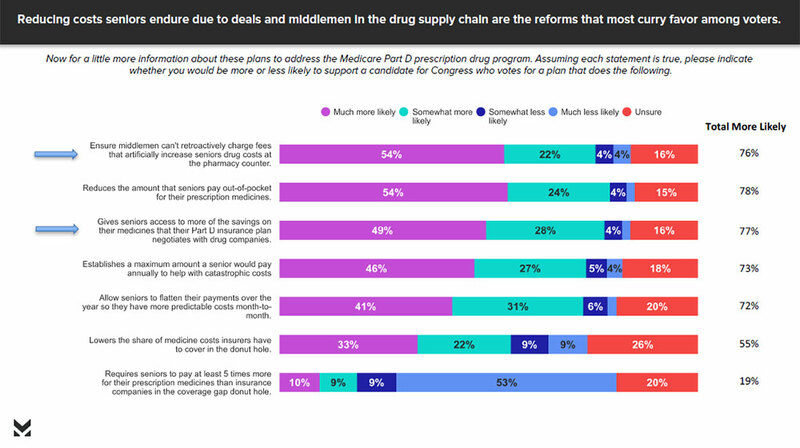 More than 75% of respondents say they'd be more likely to support a candidate for Congress who would vote for a plan to ensure PBM middlemen can't retroactively charge fees that artificially increase seniors' drug costs at the pharmacy counter. 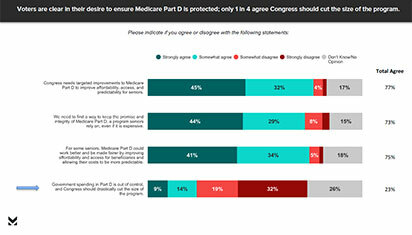 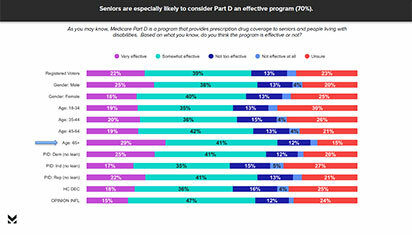 Voters consider Medicare Part D an effective program, and they are clear in their desire to ensure it is protected. 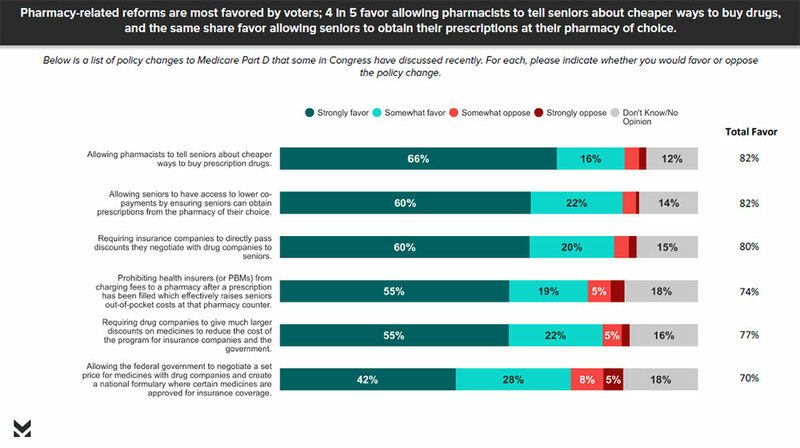 When it comes to Part D policy changes, four in five respondents favor allowing pharmacists to tell seniors about cheaper ways to buy drugs, and the same share favor allowing seniors to obtain their prescriptions at their pharmacy of choice. 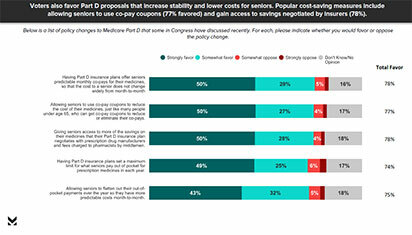 Reducing costs seniors endure due to deals and middlemen in the drug supply chain are also reforms that curry favor among voters. 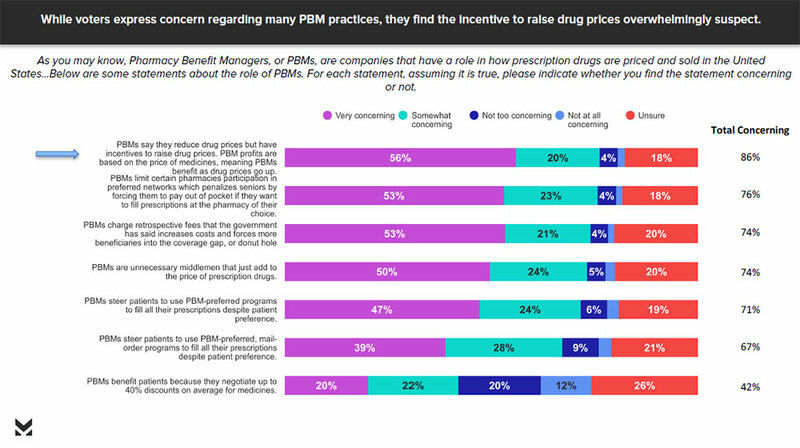 While voters express concern regarding many PBM practices, they find the incentive to raise drug prices overwhelmingly suspect.